Hey guys, following our latest major updates, it’s time to handle some smaller improvements that will make working with AWR Cloud a lot easier. In order to give you access to data for longer periods of time, AWR Cloud’s improved Keywords from GWT feature allows you to get keyword metrics beyond the Google Webmaster Tools 90 day limit. 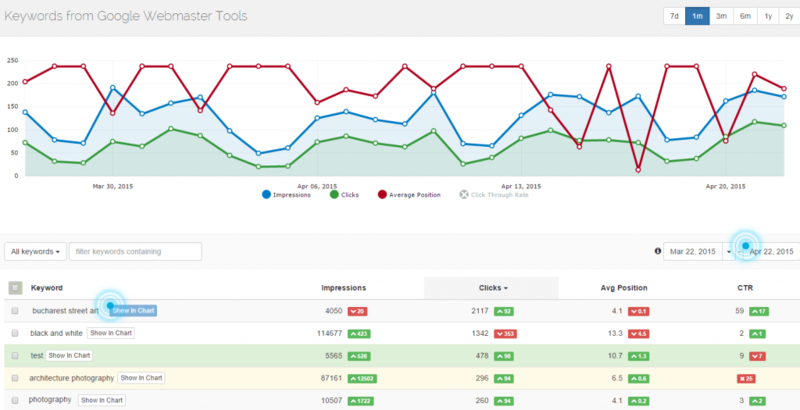 You now can select the exact dates for which you want to check your impressions and clicks and there’s no limit to how far back in time you can go! We store and display GWT metrics starting from the day you connected your Webmaster Tools account to a project. For those of you with one year’s worth of metrics, you can now view them simply by adjusting your time frame! For new connections, you can rest assured that data will be accessible long after the 90 days have passed. Reports are a major part of AWR Cloud, and with each update we aim at improving them. Let’s begin with the regular report sections. The existing Keyword Evolution was redesigned to reflect the current UI layout of the Rankings – Overview menu. 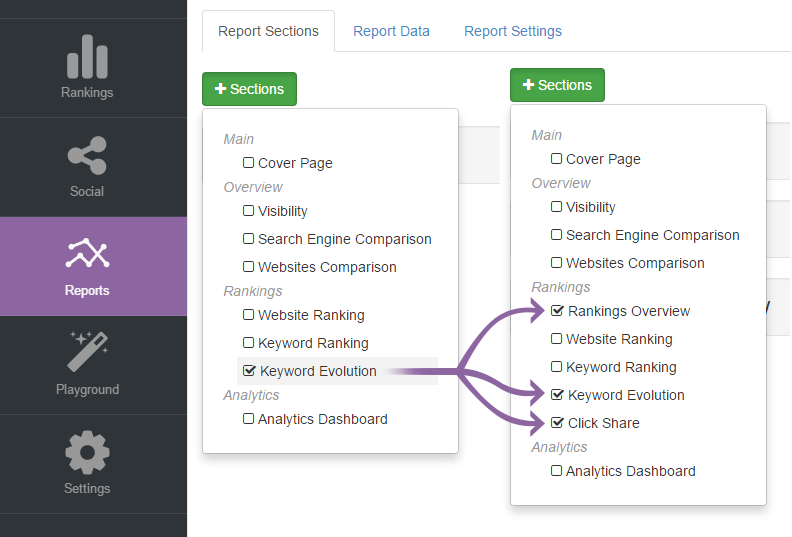 When creating a report, you can select the new Rankings Overview and Keyword Evolution sections. Click Share information now has an independent report section as well. A brand-new quick report section has been added: Keyword Groups, since a lot of our users found the information useful. You can download or email the quick report the usual way from the UI, and all your keyword groups information will be included in a PDF, HTML or CSV file. Everyone in the SEO business knows how important it is to monitor relevant results for your local customers. AWR Cloud has offered location-aware search engines from the very beginning, but sometimes incorrect data was gathered, due to simple typos. To help our customers to be confident they are collecting the data they want we’re offering an extra layer of control by validating their inputs. 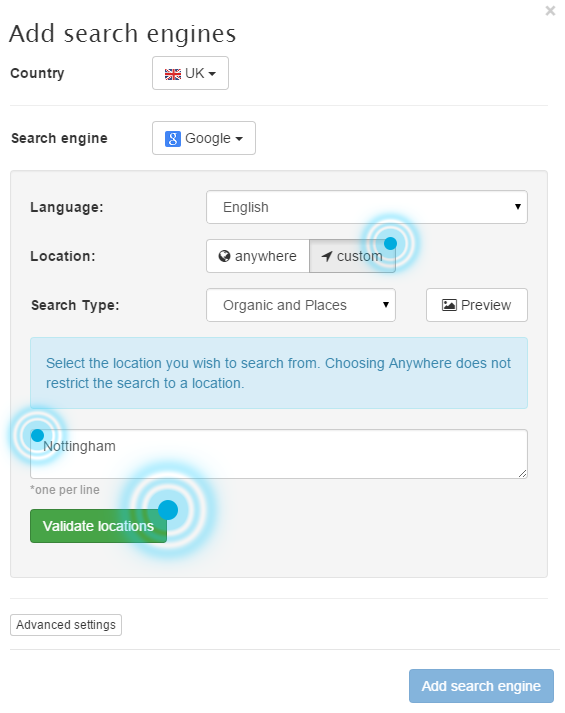 This way you never have to worry about choosing the wrong search location again! In case you’ve wondered what search results types a typical user might encounter, we analyzed the SERPs for you and came up with a breakdown of the most popular results. For any given keyword, we’re analyzing the possibility for the result pages to include ads, videos, images, local results, news or carousel results. It’s easy to pinpont trends, as this SERP breakdown can be analyzed over various periods of time. An important change from Google was their latest focus on mobile. Starting from April 21st, they consider mobile-friendliness as a ranking signal for websites on mobile platforms. We have already released some early results in a recent Mobile Frienly Study on how this change has impacted mobile search results. You can see this for yourself in the Google Algorithm Changes report on our website, or in the similar report from the Playground menu of AWR Cloud. 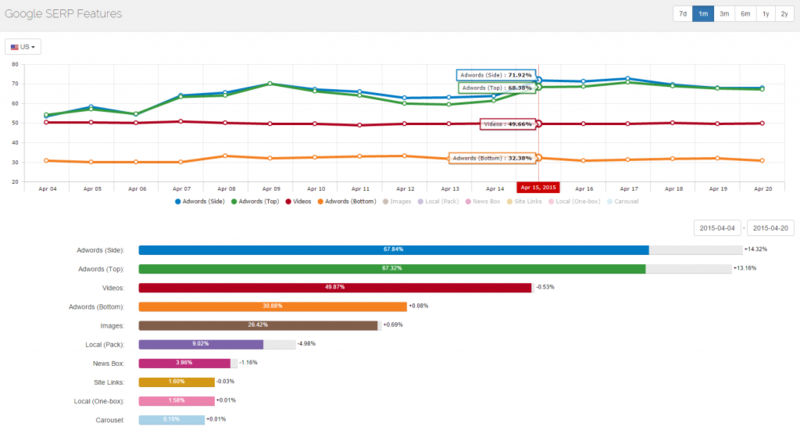 If you’re not doing this already, you too can track your Google mobile rankings in AWR Cloud and compare your desktop rankings with the mobile ones. On April 20th, Google announced that they are shifting their authentication protocols towards OAuth 2. We upgraded our authentication protocols to match their latest guidelines, and all new connections made to your Analytics or Webmaster Tools accounts will use them from now on. Existing connections in your AWR Cloud projects will not be affected, but if you want to use them for new projects, a re-authentication is needed. This is it for now! Let me know what what you make of it all and drop me a line below to share your feedback, ideas or questions. Yes! 🙂 Give it a go, let us know what you make of it! What an amazing new features! The Historical data from GWT is a diamond! Oh, SERP breakdown is also cool! It seems in the process you also removed the ability to add a competitor with the + sign in Top Sites — was there a reason for that? Cool. You know what would also be really cool that’s related? To be able to add aliases in the same way. And related — it would be really useful to be able to check individual aliases to show / not show. This would really make it easier for people to pinpoint and track their aliases indeed. I’ll be running this past our dev team next time we talk about new features 🙂 so thanks for sharing! It’s especially useful if you’re using parasite/satellite sites — don’t want to set up a new project for each of them, but you can’t currently track the success of an individual secondary site. Doesn’t seem to be fixed yet. Auch :-s send me a quick email when you find the time on ade@caphyon.com with more details (account and project name), and we’ll take it from here! Sorry that you keep running into this issue!